Fred Hutson isn’t one to miss an opportunity. Back in 2007, at age 24, he saw an opportunity to improve the distribution of marijuana to Florida by shipping it through FedEx, UPS and DHL from his mail store in Las Vegas. Unfortunately, that knocking sound he heard in October of that year wasn’t opportunity but Drug Enforcement Agency officers coming to arrest him. He did four years behind bars. When he was released to a halfway house in 2012, he knew that with a record, he’d likely be stuck in some low-paying job, if he could get hired at all. But after his stint in prison, he saw an opportunity not only to create a legitimate business but also to provide services to inmates that could help them stay connected to their families, which studies show is key to reducing recidivism. 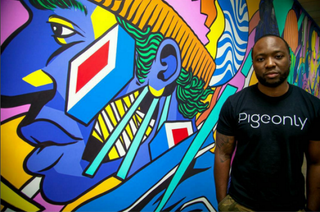 In 2013 he launched tech startup Pigeonly, which allows inmates to make Internet phone calls and share photos with loved ones at a much lower cost than what the prison system charges. Since launching the company, he has raised nearly $5 million in venture capital funding. Hutson’s story is a perfect example how black tech entrepreneurs can change the game by developing solution-oriented companies for underserved communities. By creating businesses for untapped markets, black tech leaders have an opportunity to close the disparity gap in venture capital funding by encouraging investors to open their portfolios beyond the typical dating or gaming apps that are often led by white men and their homogeneous teams. But convincing investors wasn’t easy. Hutson enrolled in the NewMe accelerator—a program launched in 2011 by Angela Benton to promote tech businesses created by people of color—to get the support he needed to pitch investors on his business idea. There was only one problem: Investors couldn’t relate to his story. With additional introductions, guidance and some help from Benton to refine his pitch, Hutson convinced investors that his model was unique and equally profitable. But he didn’t just talk the talk; he proved that his service would work by getting in front of inmates and their families and signing them up for his service to show his investors that there was a demand for his business. So how can black entrepreneurs create high-growth, impactful businesses that attract investors? According to Hutson and venture capitalists Marlon Nichols of Cross Culture Ventures and Jason Towns of the Towns Group, hot markets for innovation include health care and financial services. “[Startup founders] shouldn’t be afraid to address issues they deal with on a day-to-day basis. We shy away from creative thinking around how to solve problems within our communities because we don’t think there is a big-enough market, or that people won’t fund it,” Towns tells The Root. To put this in context, funding for financial-technology companies that make services more efficient and less reliant on software (think Mint) continues to proliferate, as shown by the $12 billion invested in related startup companies last year. Nichols cites excessive spending and limited financial literacy, particularly among underresourced communities, as an area of opportunity. Solutions for saving, managing and lending money outside of traditional banking—apt for lower-income communities where check-cashing establishments instead of banks often set up shop—continue to get a nod. The health-care-technology industry is also seeing funding in the billions, presenting an avenue for tech entrepreneurs of color to help democratize the industry. “There are things that can still be done around convenience. Food delivery hasn’t necessarily been solved yet, particularly if you don’t live in the best neighborhood,” Nichols says. Nichols’ team invests in Thrive Market—a socially conscious online store that sells natural and organic products at affordable prices. The company’s one-for-one model provides a free membership to a family in poverty for every paid membership to the online store. Another example of a breakthrough technology solution for low-income communities is Propel—an app that lets users apply for food stamps (a $75 billion industry) from their smartphones, skirting lengthy government paperwork and putting food on the table as quickly as possible. The app currently operates in New York and Philadelphia, with plans to scale to the rest of the 50 states. Crossing the bridge to solution-oriented, fundable ideas means navigating the incubator and venture capital world with a bit of savvy that Towns encourages founders to prepare for through extensive research and prototyping. Continued challenges around pattern-matching and unconscious bias will inevitably play a role in who gets funded or accepted into the top accelerator programs, but with the growing onset of municipal programming and incubators focused exclusively on inclusion, the overarching hope is that the tech and startup industries will begin to see diversity numbers shift in the right direction. In the meantime, Towns suggests that black tech entrepreneurs not shy away from smaller accelerator programs as a pathway to validation, valuable seed funding, and introductions to contacts who can support and champion ideas on their behalf. He also urges startup founders to develop a strategy for building relationships within the startup ecosystem and, more specifically, with VCs themselves.